↑ BirdLife International (2012). 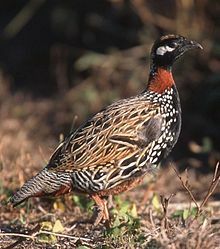 "Francolinus francolinus". IUCN Red List of Threatened Species. Version 2013.2. International Union for Conservation of Nature. Retrieved 26 November 2013.